The storm is expected to near Puerto Rico by next week. 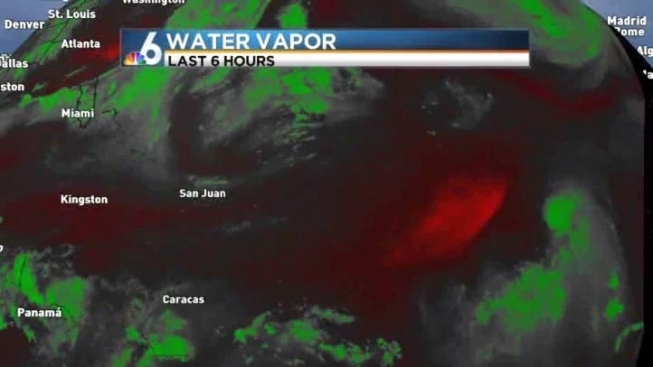 Tropical Storm Dorian weakened somewhat Thursday night as its maximum sustained winds dropped to 50 mph over the open tropical Atlantic Ocean, the National Hurricane Center in Miami said. As of 11 p.m. the storm was moving west-northwest at 20 miles per hour about 1,550 miles east of the northern Leeward Islands. Dorian's wind strength was 10 mph lower than in the previous advisory at 5 p.m.
Dorian had gained some strength Thursday morning. Tropical Storm Dorian was gaining strength at 5 a.m. Thursdsay, moving west-northwest at 17 miles per hour with maximum sustained winds of 60 miles per hour. NBC 6's Jennifer Gray takes a look at the storm's predicted path. A turn toward the west with an increase in speed is forecast for Friday. The long-range forecast shows the storm approaching Puerto Rico by next week. Dorian is moving towards warmer waters that could strengthen it, but it will also encounter some wind shear that could tear it apart. There are currently no watches or warnings in effect.